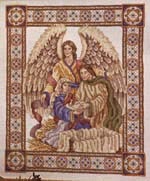 Model size: 11.75" x 10"
Description: In this elegant design, a guardian angel watches over the Holy family. An ornate border accented with beads and metallic cord finishes the piece. Dominant colors are golds and blues, with touches of mauve purple and green. Background Information: This design originally appeared in Just Cross Stitch Magazine. It was quite a challenge to design a nativity piece that was "different", as the subject matter is perhaps the most popular in Christendom. I was intrigued by the notion of a protective angel watching over the Holy family... The overall colorful-ness of the piece and the wide decorative border with it's beads and metallic accents give the design a definite Byzantine flavor. Stitching Comments: As is the case with most of my designs, this piece has its fair share or quarter stitches, blended colors, and over-one stitching (faces and hands). If you are looking for a Nativity design to hang in your home year 'round, the non-traditional colors in this piece may suit your needs.